I have some things in my life even now that I find myself pleading with God about. Some suspense-filled situations, some impossible dreams that I’d like to see God miraculously fulfill, some questions about what will happen next. Is everything going to work out the way I desire? Will God take care of this need? What is it that God has planned for me? The suspense is killing my suspense-hating heart. What I am asking for is not as selfish as a chocolate bar or as petty as a $2 Princess camera that does little more than click when you press a button—the novelty items that my children find oh-so-tempting. I’m asking out of need and out of a weighty burden for someone else. It’s not what I’m requesting that’s the problem; it’s how I’m asking. Years ago, I found myself “praying” this way most of the night every night. Begging and arguing and explaining to God. I talked and talked and talked some more to Him. When I’d said everything I had to say, I just said it all over again. Was this truly prayer? Or was it instead simply fretting in front of God’s throne? It’s not that God requires us to pretend we’re all right even when we’re not, to hide our disappointment or anger or fear and act like faith-filled super-Christians. David and Job and Habakkuk all poured out ugly truth in their conversations with Him. Psalm 51:6 tells us, “Behold, You desire truth in the inward parts” (NKJV). With God, we can always be honest. He knows what’s hidden in the dark corners of our heart anyway. Telling Him how we feel, however, invites Him to do something about it, to speak truth back to our hearts. Instead of having faith that God heard my request, that He would work on my behalf, always working things out for my good and for my benefit, that He was not only able to do the impossible, but He was also willing, even desirous, to bless me and shower me with affection—instead of praying with that faith, I was pacing back and forth at His feet, more focused on my request than on my Answer. That explains why Philippians 4:16 wasn’t working out for me: “Be anxious for nothing, but in everything by prayer and supplication, with thanksgiving, let your requests be made known to God.” I was making prayer and supplication, I was letting my requests be made known to God, but I prayed out of anxiety and worry rath er than with gratitude and worship. Chris Tiegreen also wrote, “Faith allows us to rest,” and this certainly wasn’t resting. I had justified my pleading, telling God I was willing to be the persistent widow, presenting my case to the Judge day after day after day until He granted my request. Yet, somehow persistence for me had become inextricably linked with a lack of faith. So, I followed a suggestion and created a penny cup. Needing a physical way to move prayers out of my heart and into God’s hands and then leave them there, I placed an empty mug on my desk. Every time I found a penny (which happens more often than you might realize! 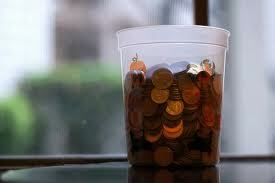 ), I placed the penny in the cup and prayed for that one specific request. I didn’t spend hours repeating my petition every night. I really only prayed about it when I moved the penny out of my hand and into the pile of other coins. And I was persistent. My pile of copper grew as I laid my request at His feet time after time. Yet, I didn’t pick any of those pennies back up. I left them there. I didn’t linger, arguing, explaining or pleading. I said a simple prayer, “God, please work the miracles necessary in this situation. I need Your help. Thank You that You work on my behalf. Amen.” Clink went the penny into the cup. Away I walked, trusting that God could take care of my need. Somehow, even though what’s going to happen is still unseen, even though the circumstances I’m in still remain unresolved, I feel less plagued by suspense. Instead, I feel reassured. I will likely continue to groan at to-be-continued television episodes and I will surely still flip to the back of the book to see how it ends before reading the first page. I hate cliffhangers and suspense and dramatic tension as much as ever. About our Christian walk, however, Paul wrote, “So then, just as you received Christ Jesus as Lord, continue to live your lives in him” (Colossians 2:6). He tells us what will happen next. It ends the suspense and resolves all cliffhangers. We will keep living our lives in Christ today, tomorrow, and the day after that. All of the specifics may be unclear, but the bottom line remains the same. We live in Emmanuel, God With Us. And when I pray in faith rather than begging and pleading, I remember that the God who is with me will take care of it. He’ll walk me through. It may or may not be what I’ve desired or planned, but it will always be in His capable, trustworthy, compassionate hands. “The Lord is good to those whose hope is in Him, to the one who seeks Him; It is good to wait quietly for the salvation of the Lord” (Lamentations 3:25-26).